^ Watson, James Dewey; Crick, Francis Harry Compton (1953-04-25). “Molecular structure of nucleic acids; a structure for deoxyribose nucleic acid” (英語) (PDF). Nature 171 (4356): 737–738. Bibcode: 1953Natur.171..737W. doi:10.1038/171737a0. PMID 13054692. http://www.nature.com/nature/dna50/watsoncrick.pdf. ^ Franklin, Rosalind Elsie; Gosling, Raymond (1953-04-25). “Molecular configuration in sodium thymonucleate” (英語) (PDF). Nature 171 (4356): 740–741. Bibcode: 1953Natur.171..740F. doi:10.1038/171740a0. PMID 13054694. http://www.nature.com/nature/dna50/franklingosling.pdf. ^ Wilkins, Maurice Hugh Frederick; Stokes, Alexander Rawson; Wilson, Herbert R. (1953-04-25). “Molecular structure of deoxypentose nucleic acids” (英語) (PDF). Nature 171 (4356): 738–740. Bibcode: 1953Natur.171..738W. doi:10.1038/171738a0. PMID 13054693. http://www.nature.com/nature/dna50/wilkins.pdf. 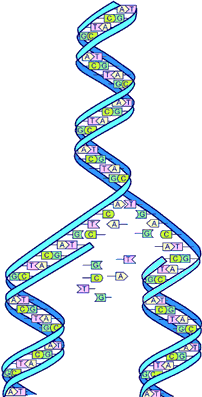 ^ International Human Genome Sequencing Consortium (2004-10-21). “Finishing the euchromatic sequence of the human genome” (英語). Nature 431 (7011): 931–945. Bibcode: 2004Natur.431..931H. doi:10.1038/nature03001. PMID 15496913. http://www.nature.com/nature/journal/v431/n7011/full/nature03001.html.